A Tamil-Brahmi script inscribed on a potsherd, which was found at the Khor Rori area in Oman, has come to light now. The script reads “nantai kiran” and it can be dated to first century CE, that is, 1900 years before the present. The discovery in the ancient city of Sumhuram has opened a new chapter in understanding the maritime trade of the Indian Ocean countries, according to specialists in history. It was by chance that the potsherd was sighted. Alexia Pavan, an Italian archaeologist, had displayed the potsherd during an international ceramic workshop on “The Indian Ocean Trade and the Archaeology of Technology at Pattanam in Kerala” held in September in Kochi. P.J. Cherian, Director, Kerala Council of Historical Research (KCHR), and Roberta Tomber of the British Museum, London, had jointly organised the workshop. Pottery from several Indian Ocean countries was on display during the workshop. K. Rajan, Professor, Department of History, Pondicherry University, D. Dayalan, Regional Director, Archaeological Survey of India, and V. Selvakumar, Head of the Department of Epigraphy and Archaeology, Tamil University, Thanjavur, spotted the potsherd displayed by Dr. Pavan. The Italian Mission to Oman (IMTO) had found this potsherd during its second archaeological excavation in 2006 in the Khor Rori area. The Director of the excavation was Alessandra Avanzini and Dr. Pavan was part of the team. Since 1997, the Mission of University of Pisa, forming part of the IMTO, has been working in Oman in two sites: Sumhuram in Khor Rori and Salut in Nizwa. The potsherd was found in a residential area of Sumhuram city. Dr. Pavan said it was part of a lid made by reusing the shoulder of an amphora. Soot traces visible along the external ridge suggest the use of the lid for a cooking pot. The sherd was discovered in a layer mixed with a few pottery pieces and animal bones, “which [layer] corresponds to one of the most important constructional phase of the city, to be dated to the first century CE,” she said. So the sherd could be dated to first century CE or a little earlier. There was so much of Indian material, including beads, coins and pottery, discovered during the excavation that it was important to show the relationship between India and the southern coast of Oman, she added. The script “nantai kiran,” signifying a personal name, has two components, Dr. Rajan said. The first part “[n] antai” is an honorific suffix to the name of an elderly person. For instance, “kulantai-campan,” “antai asutan,” “korrantai” and so on found in Tamil-Brahmi inscriptions could be cited. The second component “Kiran” also stands for a personal name. More than 20 poets of the Tamil Sangam age [circa third century BCE to third century CE] have “kiran” as part of their personal names. “Thus, the broken piece of the pot carries the personal name of an important trader who commanded a high regard in the trading community,” Dr. Rajan argued. It was generally believed that India’s contact with the Mediterranean world began with the Roman trade and much of the studies were concentrated on the Red Sea ports such as Quseir al-Qadim and Berenike, both in Egypt. 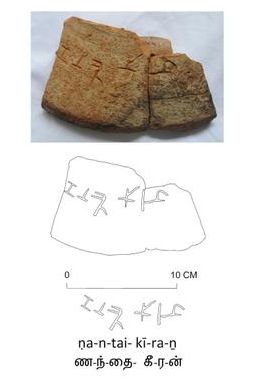 While the excavation at Quseir al-Qadim yielded potsherds with the Tamil-Brahmi texts reading “kanan,” “catan” and “panai ori,” the one found at Berenike was engraved with the Tamil-Brahmi script “korrapuman.” The latest discovery in Oman was significant as it opened a new avenue in understanding the impact of the Indian Ocean trade, particularly on the west coast of the peninsular India, Dr. Rajan said. The region was known for frankincense and there was a possibility that trade in horses could also have taken place in these ports. (Frankincense is an aromatic gum resin used for burning as incense). “Excavations by the University of Pisa have confirmed Sumhuram’s link with the ancient frankincense route and its cultural links with the frankincense-based kingdoms in southern Arabia,” Dr. Rajan said. In the context of the advanced scholarship available on Tamil-Brahmi, estimated Dr. Cherian, this epigraphic evidence from Khor Rori had a great significance. “To the best of my knowledge, Khor Rori is the first South Arabian site to yield epigraphic evidence of the early historic phase [that is, when written records began].” Earlier, in the Mediterranean maritime trade network, only Myos Hormos and Berenike (on the Red Sea coast of Egypt) and a few sites in Sri Lanka had produced Tamil-Brahmi inscriptions outside India. The importance of Khor Rori rested on the fact that it was an important pre-Islamic port-city in the ancient Indian Ocean exchanges between the Mediterranean region and India, Dr. Cherian said. The port of Sumhuram could be dated to circa third century BCE to fourth century ACE. This site could be crucial in tracing the maritime history of the Red Sea, the South Arabian and the Mesopotamian coasts and their hinterlands which could have played a pivotal role in the long-distance maritime trade between Tamilakam and the Mediterranean between the first century BCE and the fourth century CE, he added. “It is unfortunate that the geographical and the cultural significance of the South Arabian region and its links with ancient south India has not been properly studied for various reasons,” said Dr. Cherian, who recently did field studies in Oman including at Sumhuram (Khor Rori) and the nearby Al Baleed sites. The Euro-centric perspectives that became dominant after the Roman Empire seem to have erased more history than they probably produced anew. In the absence of textual evidence for the early historic period, he said, archaeological evidence and to some extent, anthropological sources such as myths were the available means to retrieve such lost histories. The substantial quantity — the largest-ever assemblage from any Indian site — of 3,384 torpedo jar fragments and 1,720 turquoise glazed pottery from Pattanam suggested the brisk trade activity between Tamilakam and the South Arabian regions. (The KCHR, in association with other agencies has been excavating the Pattanam site, near Ernakulam, from 2007. Archaeologists feel that Pattanam could be Muziris/Muciri, which was a flourishing port on the west coast during the Tamil Sangam age, which coincided with the classical period in the West). “The presence of frankincense crumbs in almost all trenches at Pattanam is yet another indication of the site’s connection with South Arabia, including Khor Rori and the Al Baleed region, famed as the ‘land of incense’,” Dr. Cherian said.